Recently, Dr. Devreaux was a soloist on the score of the hit show ‘Have and the Have Nots’ (OWN TV and a Tyler Perry show); a violinist on Justin Timberlake’s new CD ‘The 20/20 Experience’ (she played with him in the 2013 Grammy Awards as well) concertmaster of her own String Ensemble for the hit TV Show ‘The Voice’ 2011 and the lead violinist for the 2011 Grammy Awards with young artist, Bruno Mars/B.O.B. In 2008 she was one of the violinists for Aretha Franklin’s Performance at President Obama’s Inauguration. No stranger to big name celebrity musicians, Ms. Devereaux has appeared as a solo violinist at the Hollywood Bowl with Stevie Wonder, Hank Jones, Gerald Wilson, Joe Lovano, Kenny Burrell, and others Furthermore she made a special solo appearance with the ‘Disco Diva’ Donna Summers at the Hilton and MGM Hotel in Las Vegas. Dr Devereaux continues to appear on numerous recordings. Some highlights include Barbara Streisand’s CD “Love is the Answer”, and the ‘Colors of Christmas’ Tour Starring Peabo Bryson, Stephanie Mills, and others. 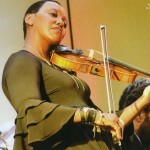 She also worked on Alicia Keys CD “As I Am” as the lead violinist in New York. You can also hear Ms Devereaux as a featured solo violinist on the CD ‘Detroit’ by the Great Jazz Legend Gerald Wilson and his orchestra. Just as strong as a classical musician as any other style, Ms. Devereaux has served as Principal Violinist for Opera Great Luciano Pavarotti in Las Vegas at the Caesars Palace and has toured with Andre Bocelli. The list of great musicians Ms. Devereaux has performed and/or recorded with is endless. Many are Jazz and Pop Greats such as: Willie Nelson, Melissa Manchester, Peabo Bryson, Chaka Khan, Erykah Badu, T.I, Billy Higgins, Ernie Andrews, Herbie Hancock, Art Hillery, McCoy Tyner, Nancy Wilson, Teddy Edwards, Natalie Cole, Dianna Krall, and others. In addition she has also performed with great artists like: Justin Timberlake, Queen Latifah, Paul Anka, John Legend, James Brown, Allan Holdsworth, Alan Jackson, Isley Brothers, Smokey Robinson, John Williams, James Horner, Johnny Mandel, Celine Dion, John Clayton, Jeremy Lubbock, Frank Sinatra, Vanessa L. Williams, Whitney Houston, George Duke, Luther Vandross, Geroge Benson, Kenny G, Roberta Flack, Lionel Ritchie, Diane Schurr, Kathleen Battle, Patti LaBelle, Dianne Reeves, Barry White, Vikki Carr, Nina Simone, Stanley Clarke, Johnny Mathis, Anita Baker, James Ingram, Karen White, and many, many others. Dr. Devereaux received her violin training from Earl Carlyss (Julliard String Quartet), Anne Thatcher, and John Sambuco, among others. She earned her Bachelor’s degree in Violin from Chapman University.